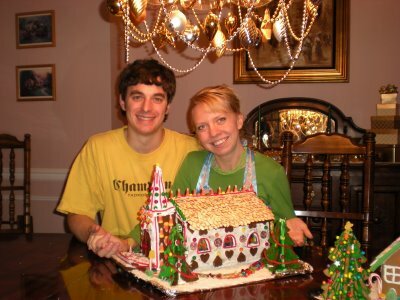 John and Heather with their Christmas Chalet! 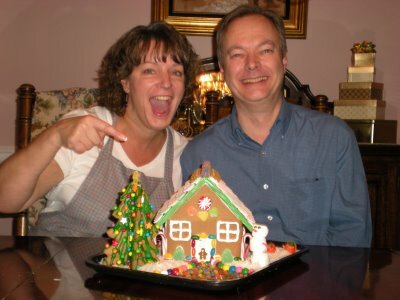 Patti and Jeff with their Candy Cottage! Eric and Diana with our country chapel! Thank you guys so much for voting. Let me just tell you how important this was to my darling hubby. 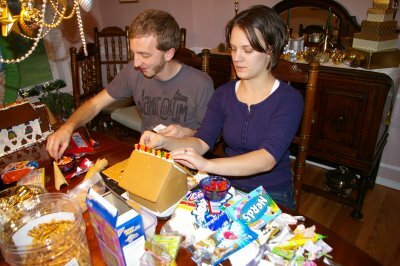 I made our house from scratch to save money, and was trying to think of the cheapest and least amount of candy we could get to cut costs there as well. At the store, I was explaining to Eric that we were going to draw shingles on the roof with frosting. 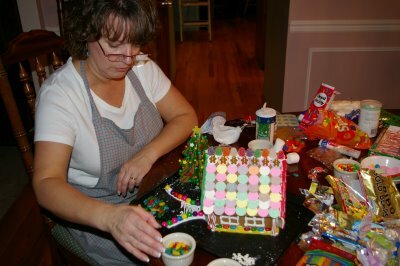 He insisted that his mom would make Necco Wafer shingles and so we had to have some kind of real shingles. I explained to him how I was trying to save money (he is the thrifty one who hates spending money), but he said “I want to win, and if we’re going to win we need shingles.” I thought that was so cute that I started shouting out different shingle ideas “wheat thins! triscuits! chewing gum (which was a sacrifice to suggest because I HATE gum)! Airheads! almond slivers!” As soon as I said almond slivers his eyes lit up with excitement. 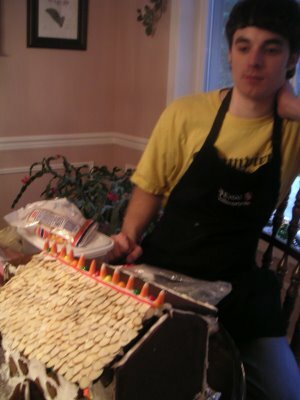 He was even the one smart enough realize we should buy them in the bulk food section, not the baking section. In the picture below he realized that all the big whole almond slivers were used up on one side of the roof and he still had a side to go. He did such a good job on the roof and I was very impressed. 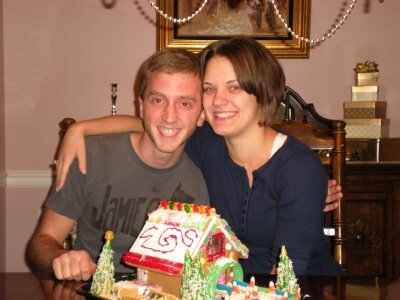 I’m sure you could all tell that Eric’s mom was the experienced ginger bread house maker. Hers was so neat and meticulous. Now I understand why Eric kept wanting to wipe up all our frosting and make things even, it totally makes a difference, and his parents’ house looked so professional. I think if his mom was in a Christmas apron she’d look like a young Mrs. Claus in this picture! If you want to see how we made our house from scratch, check it out here. It was a LONG process. But it cost about half the price, and we won, so it was worth the extra effort! Thank you all so much again. You really added to the fun of this experience and helped make it a great memory for all of us. I am so glad you won :)It was a great idea to do a competition and also to do it all from scratch is the best. I was hoping that was yours I was voting for. They all were really beautiful! Congrats! I hope the Chalet folks weren’t too disappointed. I voted for their house… I loved the wheel chair ramp idea! I loved your house too. Congrats! I actually loved all the houses… it was very difficult to decide. I made a Gingerbread house last year and swore I’d never do it again. You all impressed me. I may have to give it another whirl. Yay! Thank you for sharing more about the construction of your chapel! All of the houses turned out beautifully (much more so than mine ever do) — loved this set of posts. Congrats! What a fabulous idea to do with family and friends!